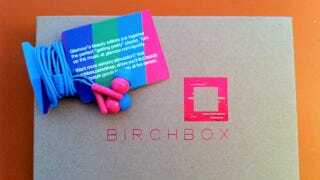 Birchbox: At Least Those Crappy Earbuds Are Cute! Last week I wrote, with no small measure of excitement, about how Birchbox—the monthly mail-order grooming service for woman and recently men, too—had finally included a gadget in their women's box, rather than the usual bonus candy or snack samples. Because by the way women like—and use—tech, too. I brought my bonus earbuds on the bus to DC this weekend and found them to perform not better or worse than the pair that came with my iPhone. But, Gizmodo-reader Miriam G-C wrote in to say that she had received a faulty pair and, disappointed, wrote in to Birchbox to communicate as much. The headphones I received in the July Birchbox do not work in stereo- only one ear has sound. I really like them and they're adorable, could I possibly get another pair? Thanks for writing in and I apologize for the delayed response. I'm sorry you're unhappy with the headphones this month. While we understand that these headphones may not be top listening quality, we thought it would be fun for summer to replace your regular white buds with a pop of color. Make sure to check out Glamour's perfect "getting pretty" playlist at glamour.com/spotify.